I love old buildings and automotive history. I connected a few dots today that peeked my interest. I just learned that my Chevelle was built at the KC Leeds plant, which is literally 13 miles from my house. I have been by the plant many times but I didn't realize it built A bodies, mainly Chevys, for years, mine included. The plant has been converted into a warehouse and indoor storage area, so it still exists today. I did a little research on the history of the plant, but there's not much out there. It opened in 1928 and was the oldest plant in operation before it closed in 1988. It sounds like in the days of Fischer Body, there was a literal hole in the wall that allowed the bodies pass to the final assembly line. Anyway, thought it was kind of interesting. I share your passion, having grown up in the Detroit area. Around here we have buildings not only from GM but early Ford, Chrysler, Dodge, Packard, Briggs, Fisher etc assembly and fabrication shops, their respective world headquarter buildings, proving grounds and their residences and personal estates as well. 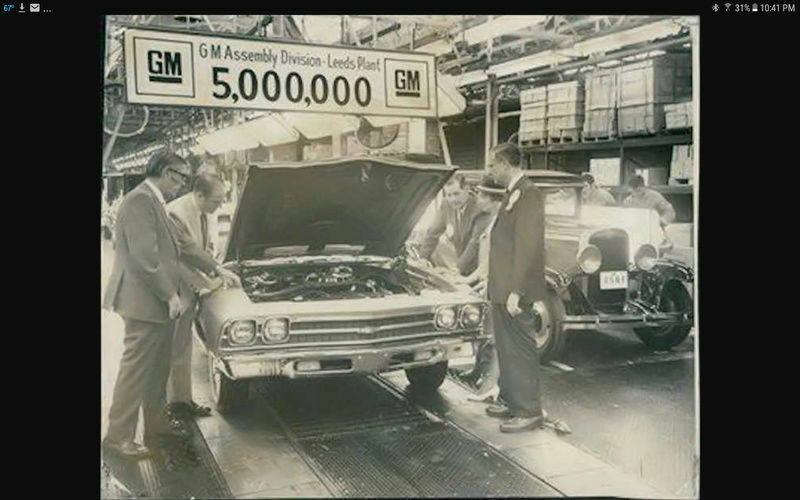 My alma mater, Chevrolet Flint Assembly, was originally a Chevrolet plant on one side and Fisher body on the other. When I started there in 1979 it was wholly a Chevrolet plant dedicated to assembling light trucks and there was a opening in the wall to connect the two sides and allow fork truck traffic to pass through. In Pontiac Michigan, where all three of my Pontiacs were built, there was an enclosed overhead conveyor that connected the Fisher Body plant on Baldwin Avenue to the final assembly location on Joslyn Road. For Buicks built in Flint the completed bodies were actually shipped across town, via open truck, to the final assembly plant on the south side of Flint. As a KC resident myself, gotta say I'm proud to own & drive a 1973 Monte Carlo that was built at Leeds. Seeing that letter "K" in the VIN & knowing that it was built here is kinda cool to me. Driving by Leeds when leaving the Royals games always makes me wonder about the folks who worked there and who might have built my car back in the day. TW Monte wrote: As a KC resident myself, gotta say I'm proud to own & drive a 1973 Monte Carlo that was built at Leeds. Seeing that letter "K" in the VIN & knowing that it was built here is kinda cool to me. Driving by Leeds when leaving the Royals games always makes me wonder about the folks who worked there and who might have built my car back in the day. That's kind of how I am, too. All of my Pontiacs were built approximately 13 miles from where they now reside. I also had a couple pickups built in Flint, both of which I followed down the line as they were built and one of which I drove off the end of the line myself.